Grapefruit shandy is a very refreshing version of the popular Bavarian radler and a direct descendant of the Shandygaff. 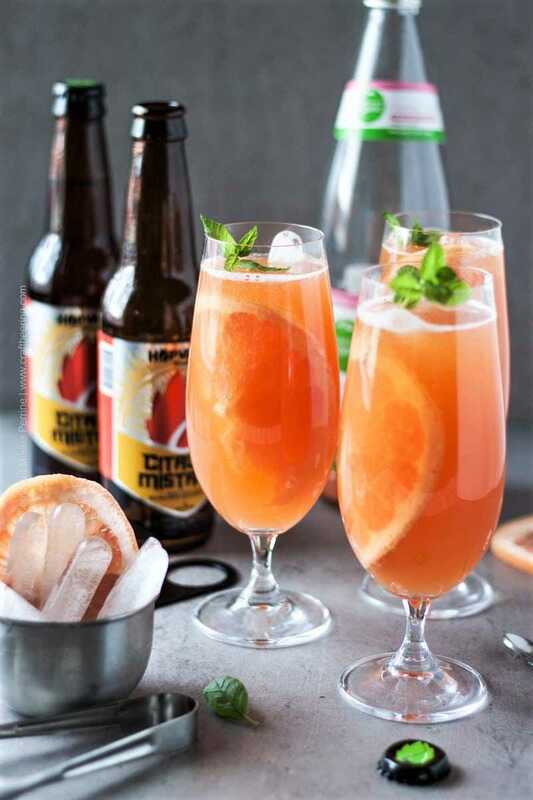 In this recipe we use a citrusy American IPA (a superb grapefruit beer) and mix it with grapefruit soda. Before I get started praising the virtues of the grapefruit summer shandy craft beer cocktail let me reference the notion of grapefruit beer. The refreshing citrusy aroma and flavor of grapefruit are especially coveted by craft beer fans. In the US hops such as Simcoe are sought after for lending a grapefruit like character to the pale ales and IPAs they are most commonly used to flavor. Other hop varieties known to impart grapefruity flavors and/or aromas are Citra, Mosaic and Nugget. Frequently, beers using these hops are brewed with the addition of grapefruit and are referred to as grapefruit pales or IPAs but grapefruit beer is not a style per se. In general, IPAs brewed with fruit to enhance the hops are known as fruit IPAs. However, they do not comply with the officially defined guidelines of the fruit-beer categories of the Brewer’s Association – American-Style Fruit Beer, Fruit Wheat Beer and Belgian-Style Fruit Beer. A grapefruit IPA or a grapefruit beer are then quite loose as notions. Nevertheless many people use the terms and you will be clearly understood if you did too. 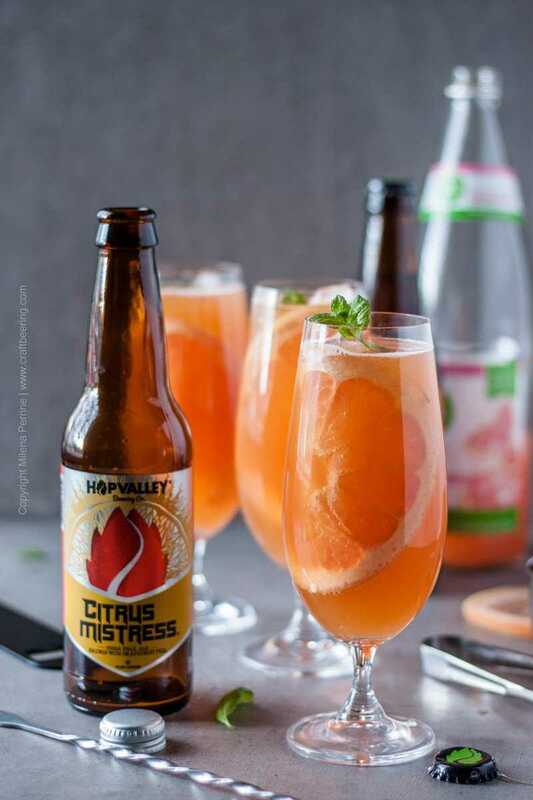 For example the Hop Valley Brewing Co. Citrus Mistress IPA we used for this post is brewed with grapefruit peel in addition to a medley of four hops, one of which Simcoe. It definitely makes sense to refer to it as a grapefruit beer/grapefruit IPA. It has a piney and unmistakably grapefruity nose and pours a beautiful burnt orange color (the direct result of Munich malts in the grain bill). There is a confident grapefruit flavor in it, but the bitterness is distinctly American hops. ABV 6.5% and IBU 80. The popularity of shandies and radlers has motivated quite a few breweries to brew beers with their characteristics. You can pretty much go to the store and buy a shandy or a radler. The majority of these ‘pre-mixed’ drinks are overwhelmingly sweet, even though smaller craft breweries seem to be making a serious effort to address this fact by creating more balanced and hoppier versions. We do have a few local favorites. In our opinion mixing your own shandy is by far a better option to buying a commercially made one. To begin with you are free to select the base beer style and choose a more bitter brew if you please. Secondly, you can choose between a really sweet fruit flavored soda or one with more restrained sugar content. Most importantly – you are in control of the beer to soda ratio and can mix your shandy to suit your individual taste. By definition a shandy is a low alcohol blended beer and the term is thought to have originated in Britain. The name Shandygaff was originally used in reference to a blend of beer and ginger root brew. Over time the shandy part remained to mean a beer mixed with a non-alcoholic beverage. Typically, the bitters beers were used to mix shandy whereas today all sorts of styles, from lagers to wheat beers are being used. (We have a delicious Farmhouse Shandy coming to now published on the blog). In addition to sparkling lemonades and sodas, non carbonated fruit juices can be used to mix a shandy. I love to add freshly squeezed grapefruit juice to a glass about 3/4 full of piney, dunk Pacific Northwest style IPA. It works miracles. It is perhaps the only way I personally get to truly enjoy this IPA style. The strongest version of a shandy out there consists of pretty much a full glass of beer with just a splash of lemonade. It is known as Lager Top and similarly to Radler’s classic Munich Helles uses lager. 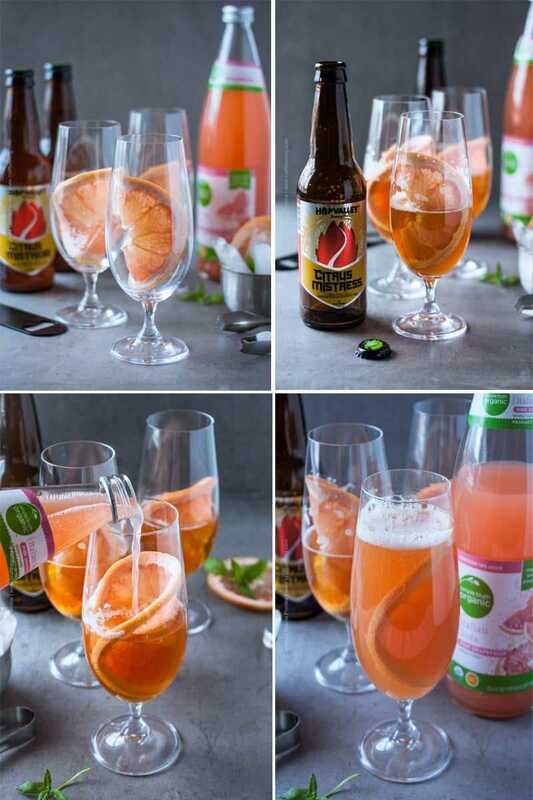 Mixing a grapefruit shandy is as easy as pouring beer and soda in a glass. You can spruce up the mixture a tad bit by using simple garnishes to activate more of the senses. Choose a visually pleasing, appropriately sized tall glass. The glasses in these pictures are 12 oz stemmed pilsner glasses. For a visual feast for the eyes place a thinly sliced grapefruit circle inside each glass. Place it so it hugs the inside curvature of the glass which will prevent it from moving around once the glass is filled. Fill half (or a little more than half) of the glass with grapefruit beer (see above discussion). Fill the rest with grapefruit soda. Add an ice cube or two for a sparkle effect. Garnish with fresh mint for a splash of contrasting color and fresh aroma that plays well with the hoppy aromas of the beer. Capture the essence of summer in a glass of citrusy IPA grapefruit shandy with the distinctive aromas and flavor of the fame fruit. Appropriately flavored soda sweetens the deal. Make sure the IPA and the grapefruit soda are nicely chilled. 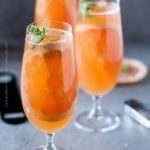 Place a slice of grapefruit in each tall glass, preferably wedging it to follow the curvature of the glass bottom to prevent it from floating to the top. First pour the IPA. Fill 1/2 to 3/4 of the glass with IPA, depending on your preference for sweetness (grapefruit sodas tend to be very sweet). Fill the rest of each glass with grapefruit soda. 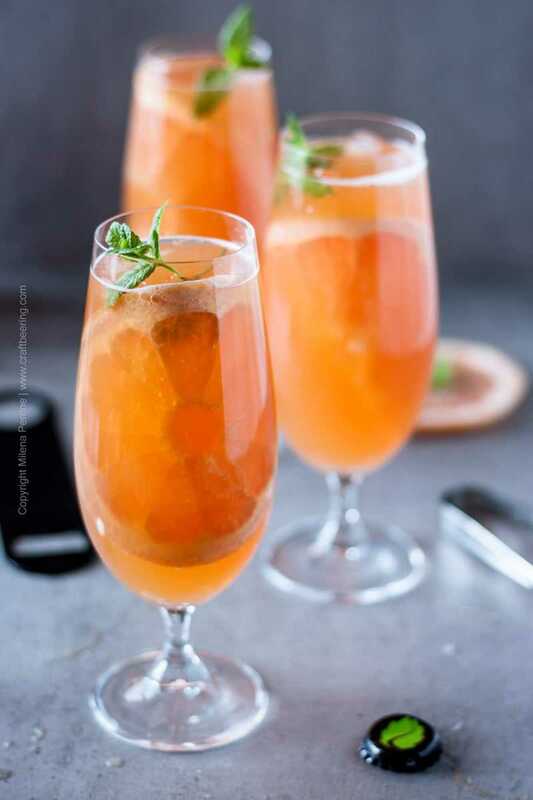 Garnish with fresh mint and drop an ice cube or two for sparkle. Very informative. My friend and I were just talking about grapefruit beers and wondered if the shandy mimicking ones are actually a category. You cleared this up. Thank you. Much better to mix a shandy with grapefruit soda than to buy a sweet shandy mimicking beer. Agreed! Beautiful photos all over and I have to agree with the others that I’m so thirsty just looking at this! Thank you so much, Marvellina! I was thirsty when I sat down at my computer a minute ago and now I’m even more thirsty. 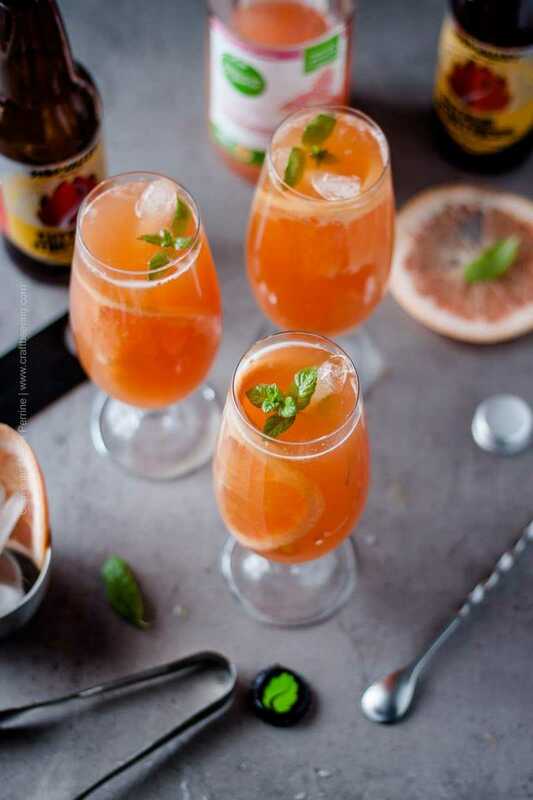 I’m going to pick up grapefruit soda at the store tomorrow–you’ve convinced me of the need to mix my own shandy :). These photos are just so beautiful I don’t know how anyone could resist! Thank you, Kelsie! Grapefruit soda and the right beers are so good together!! We occasionally dog sit our friend’s dog and they pay us with Citrus Mistress. Best payment EVER!!! I don’t’ remember if I asked you this before, but have you had Gigantic? I believe they brew their beers with grapefruit peel, it’s amazing. Before I forget, LOVE the photography, love the post.